A London CAAT map on platial.com has won a site award in the “Activism” category. 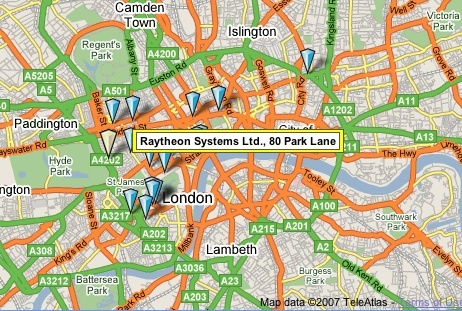 The map, called London Arms Trade, shows the locations of the offices of weapons manufacturers and distributors in London. When the local London group was set up, it was determined to highlight the immorality of the ‘defence’ industry. The map was created using CAAT’s resources and the British Defence Equipment Catalogue, to begin to pinpoint those involved in making London the capital of the world arms-broking trade. Certain things are immediately obvious. The first is the concentration of the big arms companies in the centre of the city. Companies like BAE, Raytheon and Rolls Royce are as much a part of the establishment as they can physically be. Until now, many of these death merchants have basked in anonymity. LRLIH, which owns the company responsible for agreeing to supply military trucks to Sudan despite the ongoing crisis in Darfur, has an office on Haymarket, a couple of minutes from the tourists of Leicester Square and Trafalgar Square. The fact is that we walk by these companies on our way to theatres, pubs and shops without even knowing they are there. This map is the beginning of an attempt to redress that. Please feel free to add places to the map as it is very much a work in progress. Previous PostPrevious Can I interest you in any missile components today?